Located in northwestern Wyoming, Grand Teton National Park protects stunning mountain scenery and a diverse array of wildlife. South of Yellowstone National Park, it is named after Grand Teton, which at 13,770 feet, is the tallest mountain in the Teton Range. The name of the mountains was based on the French word for breasts, referring to the shape of the peaks. Established as a national park on February 26, 1929, the park covers 484 square miles of land and water. Composed of a series of peaks and landforms, separated by lush valleys, the Tetons provide an abundance of scenic views at its many backcountry lakes, forested elevations, and jagged mountain tops. There are more than 100 alpine lakes in the park, the largest of which is Jackson Lake with more than 25,000 acres. Native American hunting parties from the northern Rocky Mountains camped along the shore of Jackson Lake around 12,000 years ago while following game. 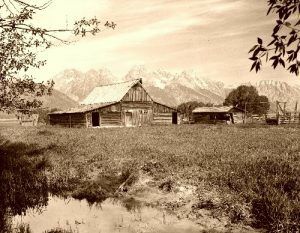 For thousands of years, Jackson Hole was used as a neutral crossroads for trade and travel routes in the area. One route followed the Snake River to its source in the Yellowstone area. Another major route traversed the Teton Pass at the southern end of the range, providing a shortcut to the Pacific Northwest region. Yet another southern route led to the Colorado Plateaus region and the Great Basin. By the time Europeans arrived, tribes such as the Shoshone, Bannock, Blackfoot, Crow, Flathead, Gros Ventre, Nez Perce and others were harvesting the valley’s seasonal riches. Native people came to hunt animals, gather plants and collect rocks and minerals. These mountains also held spiritual meaning for American Indians, a connection that endures today. The Tetons were named by French explorers who called the three highest peaks of the range Les Trois Tetons. In the 18th and 19th centuries, white fur trappers and traders called deep valleys rimmed by high mountains “holes.” One such fur trapper was named David Jackson and his favorite place to ‘hole-up’ was named after him in 1829. 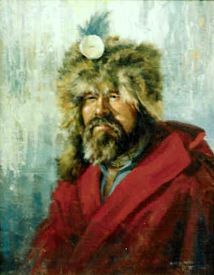 John Colter, a member of the Lewis and Clark Expedition is the first white American known to have visited the area now known as Jackson Hole as early as 1805-1806. Geologist F.V. Hayden visited the area in 1860 as part of the Raynolds expedition. In the summer of 1871, he led the first government-sponsored scientific survey of the Yellowstone area just to the north. One part of that survey, led by geologist James Stevenson, traveled into Jackson Hole via the Teton Pass before meeting up with the other half of the expedition in Yellowstone. 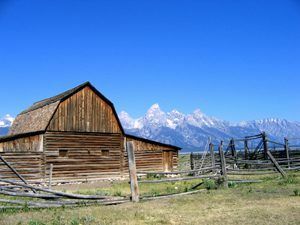 Although there were many who favored adding the Teton land to Yellowstone when it was created in the late 1800’s, the opposition of some local residents prevented the establishment of the area as a national park for some time. Due in no small part to the acquisition of lands for the creation of a park by John D. Rockefeller Jr., the park was created on February 26, 1929, although the park at that time consisted of only the mountains themselves. 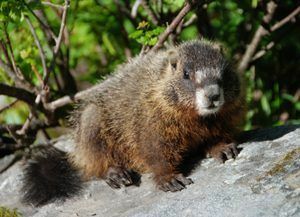 There are many different kinds of plants and animals located in Grand Teton National Park. Elk, moose, pronghorn, mule deer, and bison are commonly seen in the park. Black bears are common in forested areas, while grizzlies are occasionally observed in the northern part of the park. More than 300 species of birds can be observed, including bald eagles and peregrine falcons. The best time to see animals is early morning just before the sun peeks over the Teton Mountain Range and at dusk. Most animals can be seen near water especially Moose. The local climate is a semi-arid mountain one with a yearly extreme high of 93 °F and extreme low of −46 °F. The average annual snowfall is 191 inches, often blanketing the landscape from early November until late April. The Grand Teton National Park provides numerous opportunities for recreation in all seasons. In summer you can hike, walk, view wildlife, take photographs, backpack, camp, climb, fish, swim, boat, float, canoe, and bike. In winter skiing, snowshoeing, and snowmobiling are popular activities. Jackson Hole and its neighboring parks and forest also offer plenty of camping opportunities.